I grew up in Florida, a state with beautiful weather, but no seasons. As a child, I'd read stories about the leaves changing colors in the fall. It was hard to imagine when I was surrounded by palm trees. I've lived in Japan almost half my life now and I really look forward to seeing the autumn leaves every year. This year I made it to Korankei, a gorge outside of Nagoya where many years ago, a monk planted hundreds of maple trees in a fit of madness. Or was he mad? 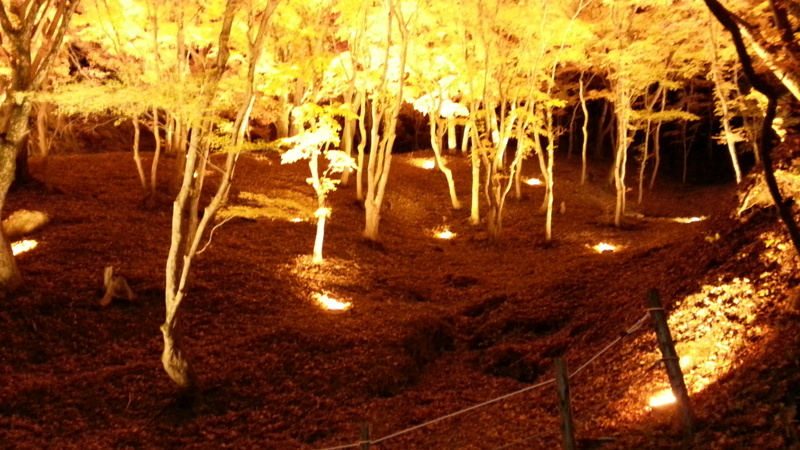 Today, Korankei is a popular place for tourists to see the leaves and is even lit up at night. Why do leaves change colors? When the winter gets colder, there is not enough sunlight for the tree to engage in photosynthesis, so the chlorophyll disappears from the leaves. What we see is the leaves' natural color! The beautiful autumn leaves at Korankei lit up at night.